Chattanooga Whiskey is the first legal distillery in Chattanooga in over 100 years, but it wasn't easy to get this far. Armed with a dream (and little political experience), the founders had to convince the Tennessee legislature to change some laws to clear the way for the distillery. Today, the distillery is up and running and creating some unique whiskey at their "experimental distillery." Bourbon & Barns: When did you first realize you wanted to open a distillery? Tim Piersant, Founder/CEO of Chattanooga Whiskey: I first wanted to build a brand after Chattanooga's history, and me and my former business partner acted on that pretty immediately, starting the company in 2011. Building a distillery wasn't even a possibility until century-old laws had to change, which I didn't know how long it would take to change. B&B: Before Chattanooga Whiskey opened in 2015, there hadn't been a legal distillery in Chattanooga in over 100 years and I understand you had to get a law changed in order to be able to open your distillery. Can you tell us about the process you went through in order to be able to open the distillery? TP: Haha. It was a process for sure. For two years, it was two 30-year-olds with no experience in politics or building a business that raised money, packaged a product, told a story, lobbied the county, packed the courthouse, lobbied the state, and opened up distilling for the entire state of TN (minus dry counties). Distilleries went from 5 to 35 in a short few years following that law change. It took us 2 more years to build the first distillery downtown since 1915, during which we had a co-founder breakup. It took us another 2 years to build the largest craft distillery in TN, and the 3rd largest whiskey producer behind Jack and George. The details of all that are complex. (Editor’s note: Jack and George, of course, are Jack Daniel’s and George Dickel). B&B: Since you weren't able to distill in Chattanooga at first, you sourced your first products. 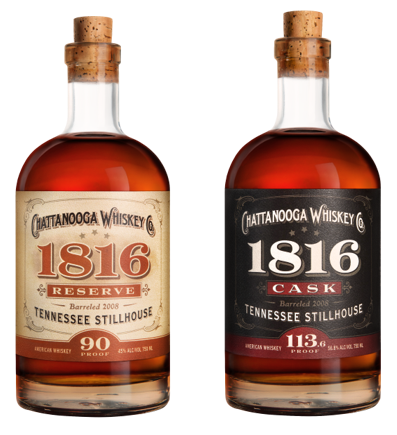 These products are a high-rye Bourbon called 1816 Reserve and a cask-strength Bourbon called 1816 Cask. How would you describe these products? What is the significance of the year 1816? TP: 1816 was the first community established in Chattanooga, along the riverfront, where our large distillery is now located. The bourbon was/is a pre-MGP bourbon, so it was actually LDI at the time we secured 1,200 barrels back in early 2012. We did go back and buy more from MGP, but we still have several hundred barrels of the original LDI product, which is now 9 years old. It is a classic bourbon recipe, and is a double gold winner at San Francisco, so they are very well received especially for the price points. B&B: You must have been excited about your first aged product release in August. What emotions do you feel as it relates to finally be able to produce and release the first whiskey distilled in Chattanooga in over 100 years? TP: As soon as we built the Experimental Distillery, we had an opportunity to begin figuring out how we would blaze our own trail in the world of whiskey. We landed on a high malt recipe very quickly, thanks to Grant's beer background, and we coined the product "Tennessee High Malt." To be releasing the first, and original, Tennessee High Malt now is really what I'm in this for. We're making a difference, we're committed to quality, and we have an awesome team leading the way. The product is awesome. Simply put. B&B: What can you tell us about the products that were released in August? Are these considered Bourbons or Tennessee Whiskeys? TP: "Tennessee High Malt" is our own style of straight bourbon whiskey, proudly produced in Tennessee. It takes flavor complexity to a level that neither Tennessee Whiskey or your traditional Straight Bourbons have ever done. But, yes, it's technically a straight bourbon whiskey. We do not charcoal filter. (Editor’s note: To be considered a Tennessee Whiskey, the whiskey must undergo a certain process, which includes filtering through charcoal). B&B: Your distillery is called Chattanooga Whiskey Experimental Distillery? What does it mean that you are an experimental distillery? TP: We have put away over 170 barrels in an underground & heated cellar (naturally heated by our equipment). Of those 170 barrels, we have over 50 different styles of bourbon, all in mainly 53-gallon barrels, utilizing different toasts and chars. We push the utilization of malt and yeast to the next level. Not a single barrel has less than 25% malt. Many of which are over 51% malt. I don't know of another distillery in the country that has such an operation. B&B: You are currently building a new, larger distillery and barrelhouse in downtown Chattanooga. This must be a sign that your vision of creating a distillery in Chattanooga has proven to be successful. What's the future look like for Chattanooga Whiskey? TP: The best sipping whiskey from Tennessee is our mission. We completed the second location on Riverfront Parkway back at the end of March 2017, ironically exactly on our 2-year anniversary of the Experimental distillery. It is 50,000-square--feet, with four 3,000-gallon fermenters, a 30-foot column still and a 100-gallon pot still to finish the spirit coming off of the column. We can age over 4,000 barrels on-site, and we can produce 2,000 barrels per year. That production capacity is committed to Tennessee High Malt. Seventy percent of our capacity is allocated to one recipe, which was our favorite recipe out of the Experimental Distillery. B&B: Where can readers find Chattanooga Whiskey? TP: The best thing to do is follow us on Instagram (also FB and Twitter), and sign up for our newsletter on our website. Grant writes a lot on our newsletter, and provides lots of details about how we are doing things. (Editor’s note: You can find Chattanooga Whiskey on Facebook at @ChattanoogaWhiskey, on Twitter at @ChattWhiskey and at www.chattanoogawhiskey.com). B&B: Please add anything else you would like to add? TP: Be on the lookout for Chatt Whiskey. We're coming! !